The New York Mets have already made one big splash this offseason, acquiring Edwin Diaz and Robinson Cano from the Mariners. By the looks of things, they are far from finished. 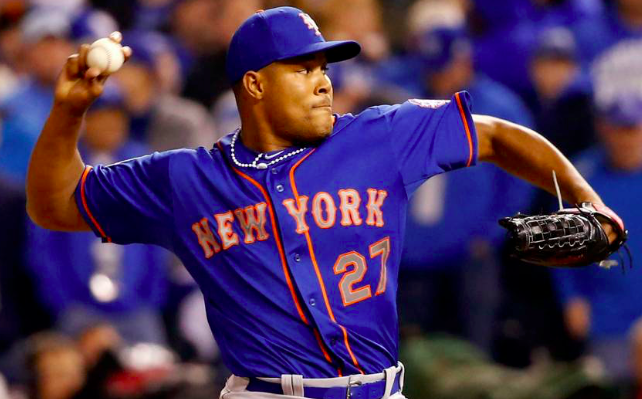 Early Thursday morning, the Mets agreed to a deal with former closer Jeurys Familia. The deal is reportedly worth $30 million over three years, bringing Familia back to Queens. Familia, of course, spent his entire career with the Mets until being traded to the A’s last summer when the Mets were out of contention. After helping Oakland secure a wild-card spot, Familia reached free agency for the first time in his career. He was apparently eager to return to his old stomping grounds and the only organization he knew before last summer. It’s not surprising that Familia would want to return to the Mets, but it’s a little surprising that he’s doing so knowing that he won’t be the team’s closer. After acquiring Diaz earlier this offseason, there’s little doubt that he’s in line to be New York’s closer of the future. Obviously, Familia knows that he’s not returning to the Mets to be their closer despite amassing 123 saves during the first five and a half years of his big league career. However, he’s apparently content being a setup man, a role he thrived in for the Mets before becoming the team’s closer in 2015. For the Mets, the return of Familia figures to be a slam-dunk. Outside of a 2017 season that was marred by a 15-game suspension for domestic violence and a shoulder injury, Familia was a top-flight relief pitcher during his time in New York. He also appeared to return to full health this past season. At age 29, Familia is still in the prime of his career and should be a reliable back-end reliever for the next three seasons. As mentioned, Diaz will be New York’s closer in 2019. That leaves Familia to serve as the primary setup man, which may be his best role. Familia has shown the ability to throw more than one inning at a time. In the past, the Mets have also brought him in the middle of innings. Now that he won’t be used as a closer, Familia could serve as an Andrew Miller-type setup man, pitching whenever the game is on the line, even if it’s not the 8th inning or later. Even with Diaz and Familia onboard, the Mets may still be looking for bullpen help. They’ve been connected to Miller, who is also a free agent, as they are still in need of a lefty. However, they also have Seth Lugo and Robert Gsellman, who both excelled in setup roles last year. Like Familia, both Lugo and Gsellman are capable of pitching more than one inning at a time, giving the Mets impressive depth and versatility in their bullpen. At the start of the offseason, a reunion with Familia did not appear to be high on New York’s list of priorities. But as promised, new GM Brodie Van Wagenen has been aggressive in trying to turn the Mets into a contender. Bringing back Familia, especially in a set-up role, is a huge step toward improving the team’s bullpen and making the Mets look like a team that will compete in 2019.